Levon Nazarian, MD, a radiologist at Thomas Jefferson University Hospital in Philadelphia, examined a patient in his 30s with a large mass on his knee. “It was so large you could see it from across the room,” Nazarian recalls. Yet two MRIs showed nothing abnormal. Only when Nazarian performed an ultrasound on the knee did he discover the problem: The patient had a mass that popped in and out of his knee joint when he bent his leg. Ultimately, the mass proved to be fat, which was not serious, and was removed. The reason the MRIs could not show an abnormality on the patient’s knee is because they were done with his leg straight. Using ultrasound, Nazarian could scan the patient’s knee while it was bent. “Had we not had ultrasound available, doctors still may be scratching their heads trying to figure out what was going on,” Nazarian says. Nazarian told this story at a forum sponsored by the American Institute of Ultrasound in Medicine (AIUM) in New York City in November. The forum was held as part of the AIUM’s Ultrasound First campaign, which is designed to get more physicians to think of ultrasound first because it can be a safe, effective, and less expensive imaging modality than CT or MRI. He says his story is a good example of why ultrasound should be a primary imaging modality rather than an afterthought when making a diagnosis for many diseases and conditions, especially those that are musculoskeletal. The AIUM campaign dovetails with the ACR and RSNA Image Wisely campaign intended. Launched at RSNA in November 2010, the aim of Image Wisely is to reduce the amount of ionizing radiation to which patients are exposed through medical imaging. Ultrasound does not use ionizing radiation. Not only does ultrasound not involve radiation exposure, it’s also less costly than CT or MRI. Using ultrasound in place of MRI where appropriate could save the healthcare system billions of dollars each year, according to Nazarian. A 2008 study in the Journal of the American College of Radiology found that appropriately substituting ultrasound for MRI in musculoskeletal studies could save $6.9 billion by 2020, says Nazarian, who helped author the study. Yet most referring physicians and radiologists think of CT and MRI before ultrasound for several reasons, including reimbursements and the comfort level with interpreting CT and MRI exams. Nazarian has no doubt that radiologists prefer CT and MRI partially because the reimbursements for these exams are much higher. “I guarantee you that in an alternative universe where ultrasound paid four times as much as MRI, physicians would encourage having more ultrasound done,” he says. Ultrasound is less costly largely because the equipment needed to perform a sonogram is less expensive, says Beryl Benacerraf, MD, a professor of radiology, obstetrics, and gynecology at Harvard Medical School who also was a featured speaker at the AIUM forum. An ultrasound machine can cost upwards of $100,000. Depending on the technology, CT scanners and MRI machines can cost at least five times as much and require more expensive installations. Benacerraf says there’s an innate conflict because radiologists admittedly have an economic incentive to favor MRI and CT over sonograms. “Studies are reimbursed according to the cost of doing them, and because the MR and CT equipment is higher so are the reimbursements,” she says. With the national emphasis on cutting healthcare costs, it would seem that insurance companies would favor ultrasound over CT or MRI when appropriate, but that’s not the case, Nazarian says. Many insurers don’t reimburse for ultrasound and can make it difficult for physicians who order an ultrasound rather than CT or MRI. Benacerraf says that “strangely enough” payers are not reimbursing for 3D ultrasound, but they are for MRI even though 3D ultrasound is equal to MRI, if not better, in many applications. Lynn Fordham, MD, a radiologist at the University of North Carolina at Chapel Hill who represented the Society for Pediatric Radiology at the AIUM forum, says pediatricians often are willing to switch to ultrasound if the radiologists point out that their questions regarding young patients could best be answered with a sonogram. “But insurance companies make it difficult because they require that the study be reordered, and reauthorization can be a hassle,” she says. One barrier to broader ultrasound use is that referring physicians and radiologists are more comfortable reading CT and MRI scans, partly because “ultrasound depends so much on the skill of the sonographer,” Nazarian says. CT and MRI require proper patient positioning, but the image quality depends less on the skills of the technologist operating the scanner compared with how a sonographer manipulates the ultrasound transducer. While Nazarian believes radiologists overestimate the operator dependence issue with ultrasound, he says it makes them leery and less likely to perform a sonogram when they believe CT or MRI will show them what they need. While sonography is operator dependent, Nazarian says anyone who devotes himself to learning it can. Nazarian says that having been present at the birth of MSK MRI, he knows that there is a learning curve with any new technology. 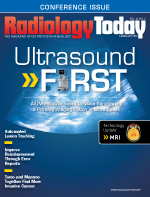 While sonography isn’t new, he says, radiologists should receive more training in the performing and interpreting sonograms in their radiology residences and fellowship programs. Benacerraf says many physicians order certain imaging exams out of habit. “Since the advent of CT and MR, interest in ultrasound has faded among radiologists, and they just go to CT and MR,” she says. Getting them to think of ultrasound first requires education and more familiarity. Additionally, many musculoskeletal abnormalities, such as a snapping hip or ankle, are not present at rest, Nazarian says, making a dynamic exam like ultrasound more appropriate than a static one like CT or MRI. So in certain patients, such as the patient described earlier, diagnosis depends on “reenacting” the position that causes them pain; ultrasound is the better imaging modality for that, Nazarian says. “When you do an ultrasound, you can put the transducer exactly where it hurts, and you can correlate what you see with what the patient is feeling,” Nazarian says, adding that MRI gives the radiologist the “30,000-ft view of an area,” but ultrasound provides the fine detail that can be the difference for making a proper diagnosis. Nazarian says ultrasound also should be the primary imaging modality when evaluating rotator cuff injuries and loose ligaments, as they can be seen more easily than with MRI. Ultrasound also can be used for a wide range of therapeutic interventions. “We can use ultrasound to guide a needle for injections of corticosteroids or other medications of the joints, bursae, or tendon sheaths while avoiding major blood vessels and nerves,” he says. At the forum, Nazarian told of having seen a patient who underwent a hip replacement but did not experience relief from pain and discomfort. A follow-up sonogram revealed the patient had a hernia that was present only when he strained. “We could have saved the patient the pain, suffering, and cost of hip replacement surgery if he had had an ultrasound first,” he says. Beyond the images themselves, Nazarian says ultrasound can serve as an alternative for patients who are claustrophobic or who have pacemakers or other metal in their bodies, making it difficult or impossible for them to undergo CT or MRI. Benacerraf says using ultrasound to diagnose women with pelvic pain isn’t standard practice but should be. Pelvic pain can make many women miserable, yet it is one of the most difficult areas to treat and diagnose. However, most patients with pelvic pain come to ultrasound only after CT or MRI fails to achieve a diagnosis. Fordham says that when it comes to children, it is even more important to consider ultrasound first. Many times children are frightened of CT or MRI scanners and must be sedated, but ultrasound can be done without sedation. Physicians can use the exam results in conjunction with lab tests and physical findings. Does the patient have an elevated white blood count? Is he in pain? Where is the pain? “We have to take all that into account and then decide if we should repeat the ultrasound the next day or go ahead and do a CT exam,” Fordham says. The preliminary ultrasound can show the site (or sites) involved as well as signs of involvement of the adjacent blood vessels. “Knowing whether the child has a kidney tumor, an adrenal tumor, a liver tumor, or something else with or without local vascular invasion can be extremely helpful in planning the next imaging tests,” Fordham says. The radiologists who presented at the AIUM forum are optimistic that the message of the campaign is getting out, and they agree the key is education. “Hopefully, those who attended will bring the message back to their practices,” Fordham says. Nazarian says the Ultrasound First campaign not only fits with the Image Gently campaign but also with the theme of RSNA’s 2012 annual meeting: patients first. Radiologists need to embrace sonography, he says, so patients can reap the benefits.